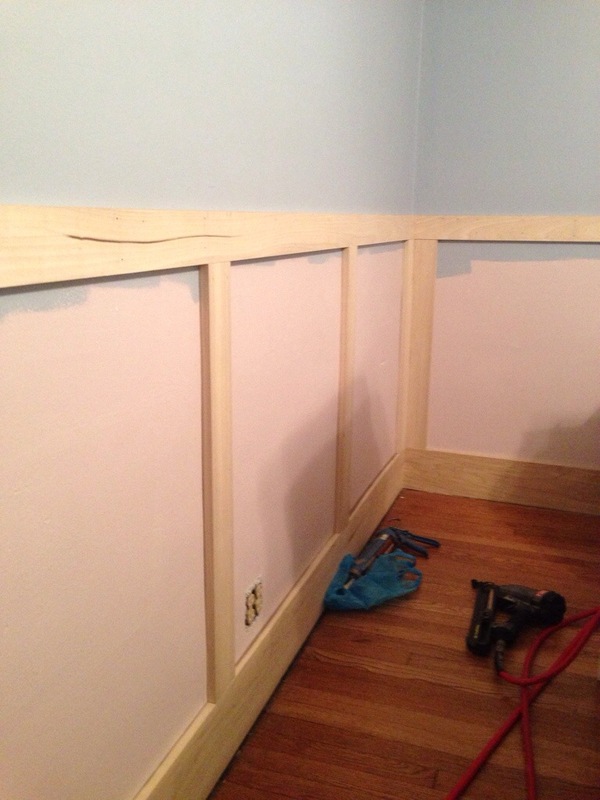 We have always loved the look of wainscoting, so after much back and forth about which style we like best, we decided to install a recessed design using the wall as the back panel. Similar to the one photographed below (from examiner.com). 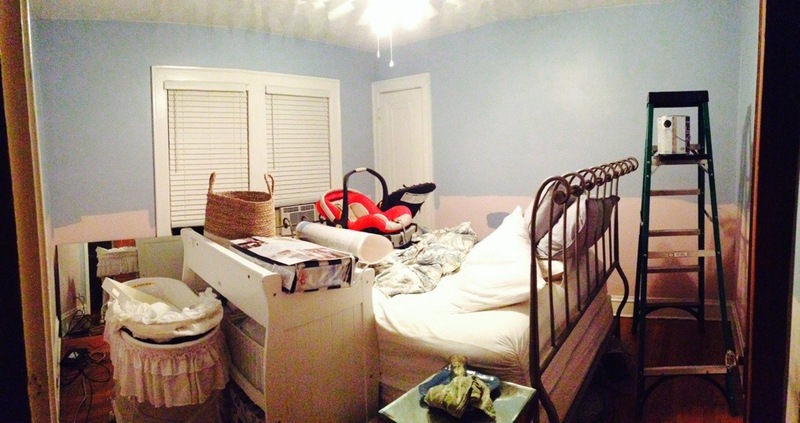 We started by pushing all of the furniture to the center of the room (we had already moved it all when we painted). From here we enlisted the help of a carpenter friend to help us with the install, but you can do this project on your own, too, and I’ll tell you how. We measured the room (again) and then purchased 1 X 4 X 10 poplar boards from our local hardware store using our carpenter friend’s discount. In total we spent about $180 on wood, not including the 1/4 round trim for finishing. 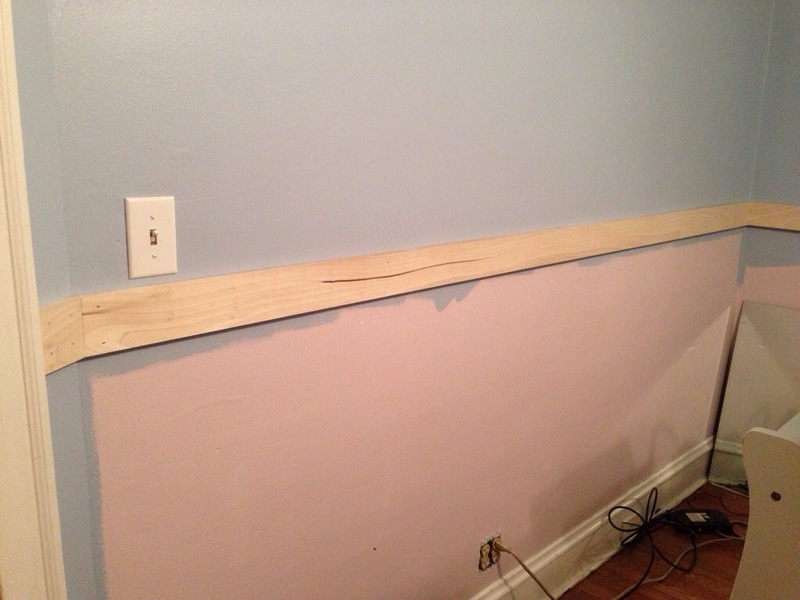 After locating the studs using a stud finder, we cut the wood to size and secured it to the wall using a nail gun. If you don’t have a nail gun, a small hammer and finishing nails will work too. We wanted the top rail to be about 46″ from the floor. 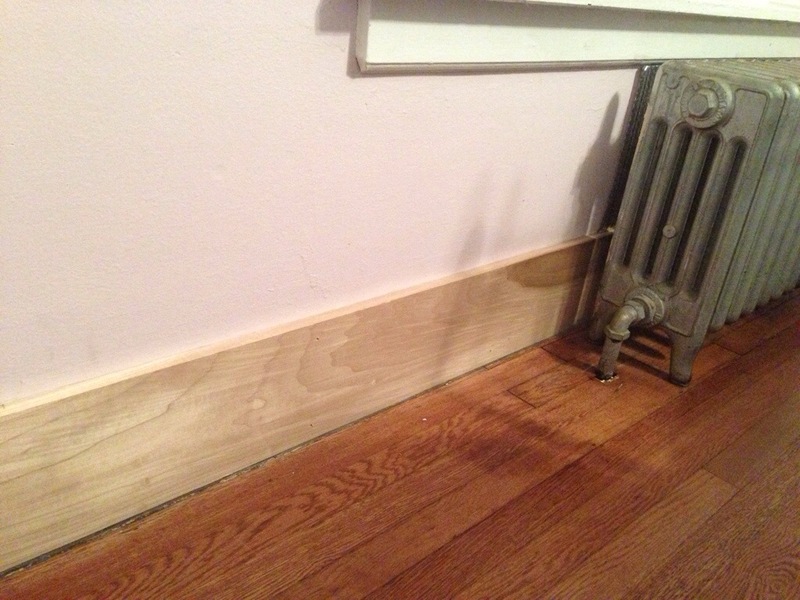 We replaced the baseboards with 1 X 8 X 10 poplar board to match the top rail. We measured from the top of the baseboard, to the bottom of the chair rail and cut 1 X 4 X 10 poplar board for the vertical boards of the wainscoting. With the boards cut to the right length, we just needed to measure out the size of the panels we wanted and nail them into place. We decided to space them about 29″ apart (this measurement was largely based on the studs throughout the room). We installed these pieces using wood glue and then nailed them into place with finishing nails/nail gun. With all of the wood in place (except for the 1/4 round detailing on the top and bottom) we’re ready to paint. Check back for that process in Stage 2. Everything looks great! My wife and I are going to tackle this project in the next couple of days. Do the boards line up flush with the casing around your doors, or do they stick out a little bit? Thanks! It was easier than we thought (even though we admittedly had help from a carpenter friend). To answer your question, yes the wood boards are flush with the molding around the doors and the windows. 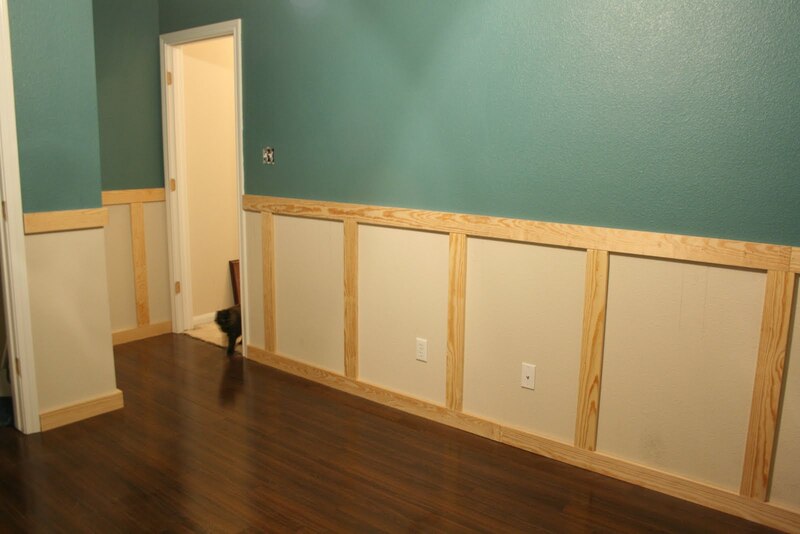 We didn’t use a panel or beadboard, we just used our wall as the backing of each section. So, this helped when it came to mounting our vertical wood boards and ensuring they were the same depth as our other molding. If anything, we would have chosen a thinner wood vs. a thicker one that would have extended further than the other molding. Less chance for injury- no jagged edges etc. to bump into. Does that answer your question? It does, thank you. We’re just bummed because the moulding around our doors is less than an inch, so the one inch boards would stick out. Wasn’t sure if you ran into that problem or not. Thanks again! If I were you, I would just remove it. 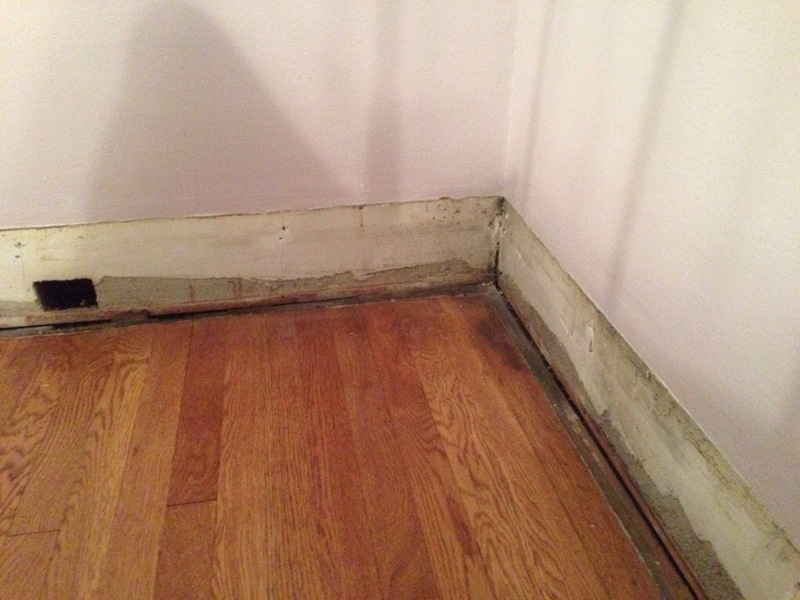 It’s essentially the same process as removing the baseboards (it seems more daunting than it is). Easier, and cheaper, to do it the way you want it the first time…otherwise, you’ll wish you had later and it might be difficult to do it at that point.